Duration: 31 sec. per ep. 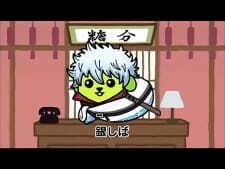 Aired as a commercial to promote the Gintama: Kanketsu-hen - Yorozuya yo Eien Nare Movie, Gintoki, Kagura and Shipachi have turned into "weird living creatures". This is a Gintama parody on the Kids Short Animation "Mameshiba" featuring the characters the sword bean-dog hybrid creatures. The fact that a commercial for Gintama has a higher rating than a lot of popular anime (-ahem- s.a.o) means quite A LOT. Before watching this ad or the movie it is promoting, please go watch or read the original anime and manga! And also go watch Gintama, if you haven't watched it yet, it's an amazing anime, filled with a compelling plot (even though the main plot is developed in bursts throughout the series), amusing characters and awesome character development, quality comedy (with lots of references), awesome fight scenes and action, suspense and lots of trolling! Don't be discouraged by the large number of episodes in the series, I was also reluctant about watching such a long series, but when I started it, I couldn't stop. It's GREAT for binge-watching! im a big gintama fan and had to see what these shorts was about. there where probably more episodes according to other intel on the internet, but these have not been captured unfortunately.